Earth has been destroyed and is uninhabitable. The people who live on a space station called Outer Earth are the only ones left. Outer Earth is overcrowded, worn down and rife with gangs. They scrape to find methods of employment, food and other goods. Riley is a Tracer, a member of the courier group The Devil Dancers. They spend their days delivering packages of unknown goods and the number one rule is you don’t want to know what you’re carrying. When Riley gets accosted by a gang who is trying to rob her of the package she carries, she gets a glimpse at what’s inside the package. She shouldn’t have done that! When she delivers the package all hell breaks loose. Riley and her fellow Tracers are now in danger. Every where she looks, someone is after her and all she can do is run. She’s not just running for her life, she’s running for everyone else’s too. The POVs switch between Riley, her friend, Prakesh, and the bad guy, Darnell. Riley is a strong lead character who endures through thick and thin. Prakesh is just an awesome, supportive-as-hell guy and Darnell is one creepy dude. I wouldn’t want to be in a room for two seconds with that guy! This book reminded me of the Wool series by Hugh Howey, in that it takes place in a dystopian habitat that is incredibly overcrowded, with a secret agenda underway. Fans of Wool will enjoy this sci-fi thriller for sure. 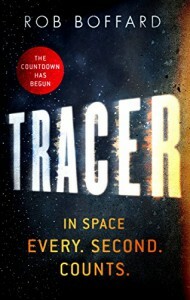 Tracer is a great go-to book if you are looking for a harrowing, non-stop, action-packed read! I want to thank the publisher (Redhood Books) for providing me with the ARC through Netgalley for an honest review.